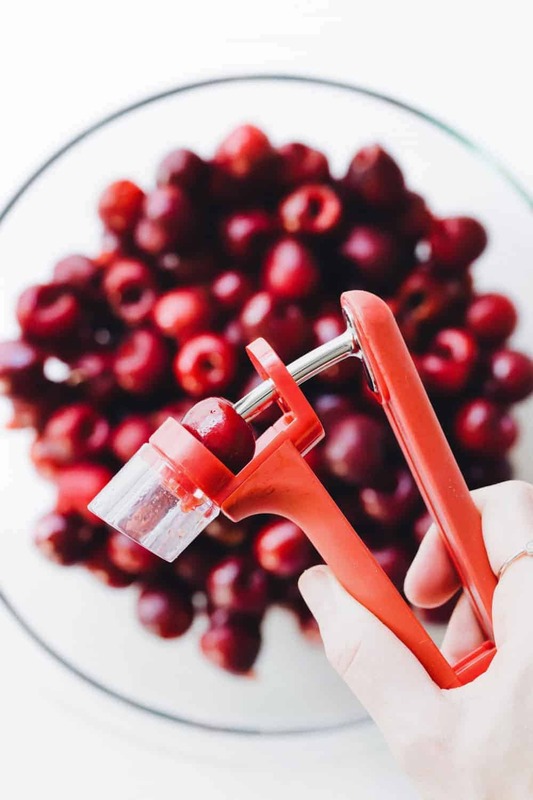 Hi, I just stumbled across this and wanted to share my tip for pitting cherries without buying a pitter: Just stick the round end of a bobby pin into the top after you pop the stem off. You should be able to wiggle the pit out pretty easily. I know this from pitting thousands of cherries from my parents’ Montmorency cherry tree every summer. I adore cherry pie, and my mom’s recipe always had almond extract in it, too. use a plastic straw to pit cherries works great!!!!!!! Thank you so much for the recipe and directions. I used sour cherries and it turned out fantastic! The only modification i made to the recipe, was that i used lime juice instead of lemon (i was all out of lemons). This Recipe is one for the book! I made this cherry pie for my father this past father’s day and it was a total hit! It was my first cherry pie, my husband helped by pitting two bags of fresh bing cherries. I realized once I had the cherries on the stove that I didn’t have corn starch on hand, so I used a quarter cup of instant tapioca instead. It came out perfectly! 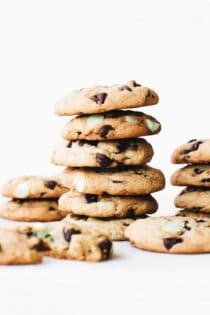 I will make it again and may use a little bit more almond extract (1/2 teaspoon instead of 1/4)….thank you so much for sharing, it is really a great recipe! Great recipe! 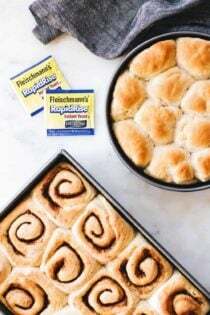 I added a little bit of cinnamon – only about 1/4 teaspoon or so – to give it a little “something.” I had absolutely no problems at all, it was easy and tasted delicious! I’m glad to hear you enjoyed the recipe! Thanks for reporting back! 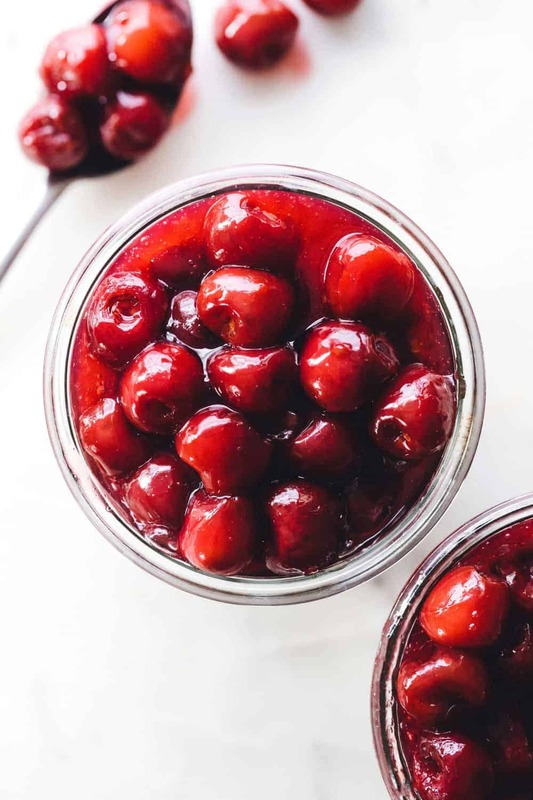 Stumbled upon your blog looking for cherry pie, right now in India we are getting cherries(yay), love them but no one has heard of cherry pie!!!! Its also raining so the cherry pie craving goes through the roof. Anyways to get that bright cherry color try beet water(boil beets in water and the water turns beautiful red) but don’t use more than a spoonful because it will add a beety flavor. Thank you for the recipe. It was so easy and delicious!!! I actually combined it with another pintrest recipe and made personal cherry pies. Everybody loved them. I thought it was intersting how you talked about your food allergy to all things cherry. I was watching Rachael Ray and they were talking about additives in food. 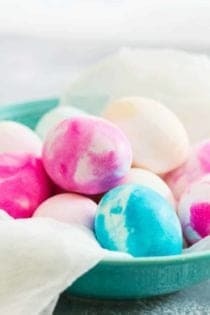 One was a red food coloring called cochineal extract. It is made from crushing up beetles. Yuck! They said it won’t hurt you unless you have an allergy. Anywho I just thought that it was interesting to hear after I had read your blog. I’m so happy to hear that you enjoyed the cherry pie filling recipe. Thanks so much for coming back and telling us your thoughts! Have a great day. I was a little skeptical about this recipe and I knew from the start that I was going to have to change a key ingredient. I am pre-diabetic and have been instructed to stay away from any type of refined sugar in favor of something with a better glycemic index. After looking around, I decided to try blue agave sweetener instead of sugar in this pie filling. It does require more for the same level of sweetness (about 3/4 a cup to a whole cup depending upon how sweet you like your cherry pie), but it works beautifully and is a huge favorite with my boyfriend and our friends over this weekend long party (Labor Day celebrations!). OH MY GOODNESS! This is so good. I live overseas and don’t have canned cherry pie filling. So, I tried this for a cheesecake topping. IT IS SOOOOO GOOD! Thanks for the simple recipe. I froze this this summer and I’m making the crust for a Christmas pie right now… Exciting! How did it work out?! Thank you, over here in Italy they don’t have canned cherries and it’s years that I’m dying for a homemade cherry pie!! Can’t wait to for summer to come!!!!! :) YEAH! I’ve got a situation…this upcoming December my son is getting married and has asked me to bake 5 Cherry Pies for the wedding reception..yes..reception is the word. 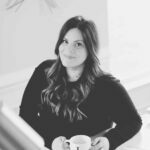 We live 2 hours away from where the wedding is to take place…can someone please help me here. Can I make a cherry pie and freeze it without baking it? 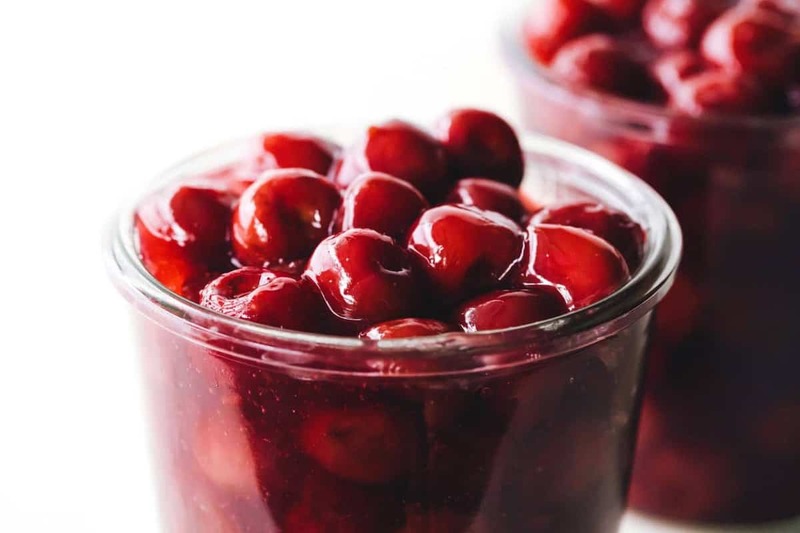 There is a church kitchen I will use to bake the pies….If there is a recipe for frozen cherry pies using canned cherries as I’m in Texas and Fresh cherries are hard to come by and costly….I’d appreciate any help or input. Thank you. 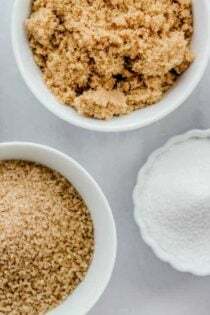 Can I use vanilla extract if I don’t have almond? You absolutely can, but the flavor will definitely be different. Lemon extract would be good too, but cherries and almonds are a classic combination. Super easy and came out perfect! That’s great to hear! Thank you so much for stopping back to let us know and have a wonderful day! My Mother was Norwegian and had a braid she wrapped around her head. Needless to say, she had lots of hairpins and they are so much better than bobby pins for pitting cherriesl. Just make sure you sterilize them before use, but I have a cherry pitter, and hairpins work so much better!! I have canned sour cherries for years( in the Northeast states we lived in)so i could make cherry pie or as our kids said chee pie. I am now in North Carolina where sour cherries are non existant and I have never used sweet cherries. I could get sweet cherries frozen- would that taste as good as sour in a pie? I think the sweet cherries would also make a great pie. Thanks for visiting. You’re welcome! I’m so happy that you enjoyed the recipe. Have a fantastic day and thank you for following MBA! Hi, there. Used this recipe this summer and made a pie for my husband, then froze the leftovers. About a month ago I used what was left for a cobbler. Every bit as good! Thanks so much for this delicious recipe. About to make another cherry pie for Thanksgiving, and no doubt I’ll have leftover for a Christmas cobbler. Terrific! Sounds fantastic! I’m thrilled that you loved the recipe. Have a wonderful holiday season and thanks so much for following MBA! hello. I just want to ask can I use maraschino cherries in the bottle? Thank you. 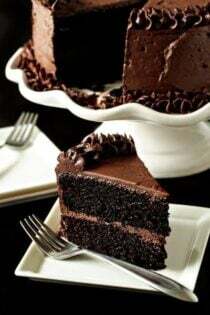 I want to try this recipe to put on my black forest cake. Mary, Maraschino cherries in the bottle are pre-sweetened, so I don’t think they’d work well in this recipe. 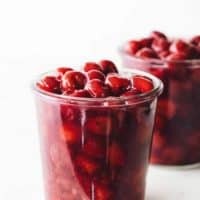 Has anyone ever canned the pie cherries? I can apple and peach pie fillings, so I will be trying this one and canning it. Did canning this recipe work? I have never attempted to can this recipe, so I am unsure how it will perform. Thanks so much for stopping by! The family story is that my grandmother made a cherry pie everyday for thirty years and since it was before freezers I’m guessing that she had to can them. I know if I had a supply of tart cherries I would be canning them. Cherry pies are my favorite. I have canned pie cherries many times. I can them in a light sugar syrup. There are also recipes in canning books for pie fillings…. I LOVE the tart pie cherries….they just add another dimension to YUM! Just made this! Amazing! I only had enough to make half a recipe and it was so good it didn’t make it to a pie…just ate it with a spoon! First time making scratch cherry pie filling. It turned out so thick and yummy! I can’t wait to make it into a pie for my Hubby :) Thank you for the wonderful recipe! 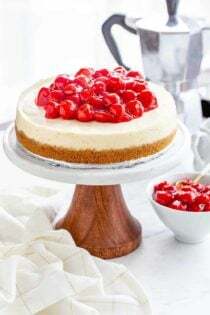 Can I use frozen cherries for this recipe? I have not tried this recipe with frozen cherries, but I’m thinking it will be just fine. Enjoy! After browsing around a couple of weeks ago for a cherry pie filling from scratch, I found myself here. As an American living in Germany, I sure miss the 4th and my Mom’s “Oh My Cherry Pie” dessert. I’ve never seen the canned pie filling here. :) And since I celebrate it anyway, I wanted to make that dessert this year. My search is over! This is it for homemade cherry pie filling! I made it exactly as stated (except I ended up pitting more cherries than I thought and wound up with about 9 cups instead of 6. Whoops! Lotsa pie and cheesecake in my future!) and it went together simply, easily, fuss-free, and tastes delicious! The only thing I had to adjust was about a cup more water (and after tasting it, a tad more almond extract for my own personal taste..it’s really perfect as stated). I think it’s due to the corn starch here. I’ve experienced the same thing with other recipes calling for corn starch or a slurry of corn starch and milk/water. 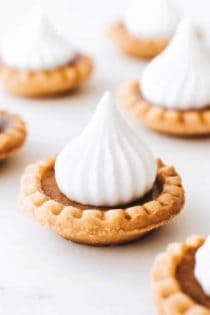 I am about to make this filling today…but I realize I don’t know how to make a pie! I bought a crust at the grocery store…do I just fill it and bake? Yes, just fill the crust and bake. I would suggest 400 degrees for about 45 minutes to an hour, depending on your oven. Good luck! Did anyone ever have success in canning thus recipe? It seems like a good one. In regards to canning this recipe. 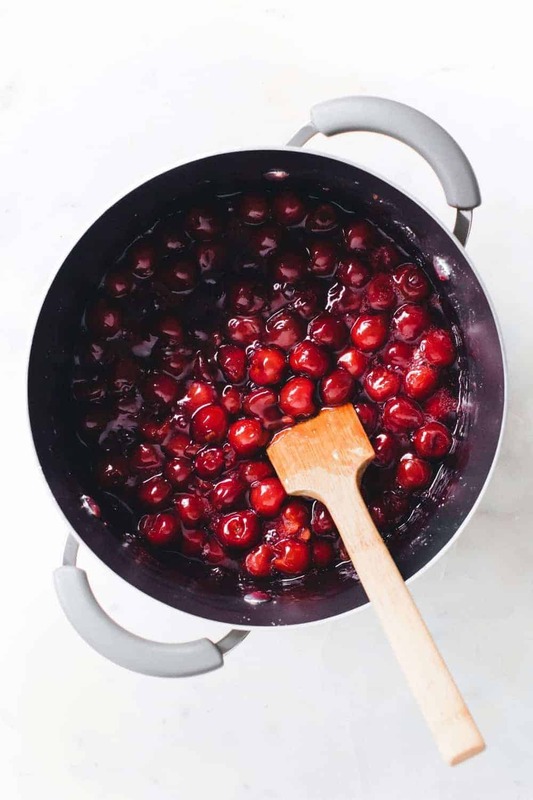 I have 30 lbs of cherries to use up and am getting ready to can pie filling…all I have read is that cornstarch should not be used in canning because of the heat (it isn’t stable). There is a product called clear gel(also a food thickener) to use instead.. I can get at local country kitchen store so just “google” it and see where you can get local. Hope this helps. Don’t want to invest in the rest of the recipe if it gets ruined because of cornstarch. sbcanning.com has the Clear Jel for sale. 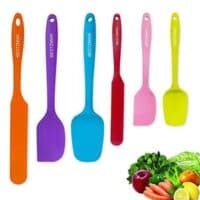 I have also bought it in larger amounts at Cash and Carry, a restaurant supply store. I have done the cornstarch method and it does get all gloppy in the jar but when baked in a pie, it just cooks into the juices as it should. Clear Jel does thicken nicely. There are 2 types of Clear Jel….instant and cooking. Make sure you purchase cooking for cooking needs. This was perfect till I froze it…..something happens to the liquid mixture, the cornstarch separates. Wish I would have just made the pie when I made the filling. It is a great recipe. LOVE this recipe… it was just the right amount of everything. Mind you I mixed all the sugar, lemon juice, starch & water first and cooked just until the sugar melted and made sure there wasn’t any lumps THEN added the cherries (each were cut in half) and carried on… delish…. I made the cherry pie yesterday and had rave reviews. Had to go and by more cherries today for a do-over….! Found myself with way too many cherries in my fridge. So even though there were Bing and dark sweet varieties, I made this recipe to use them up. I’ve never made anything with cherries and I was pleasantly surprised. This was very tasty. Will use it over angel food cake or cheesecake. Thanks! I’m so glad that you liked the recipe! Thanks for stopping by. Thanks so much for this simple, yet tasty and quick recipe. I made this today, and used it in a dump cake recipe. It was AWESOME ! Now I will be making more and canning it, because I went to my local Kroeger’s today, and what do I see sitting front row seat, Bing Cherries for 99cents a pound. Yay! I’m so glad I tried the almond extract, as it does give a kick to the cherry-like taste of the cherry pie filling. Absolutely delicious! And so easy, too! Thank you for sharing. 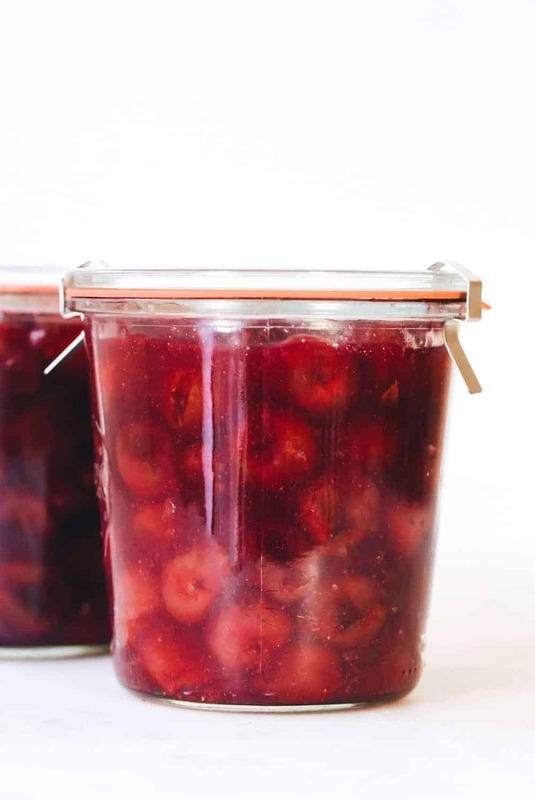 In Australia we have tinned Black cherries all they are is cherries in light syrup (not cherry pie filling like the US) can I use this method?, also I’d like to mix jarred (European sour cherries) how would this turn out? I don’t have any experience with the jarred European sour cherries but I think that it would be worth a shot if you have them on hand. Thanks for stopping by. 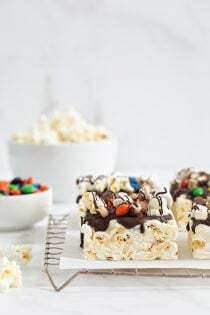 I am going to make this on the weekend. I am not a seasoned baker so when I do bake I like measurements to be precise , especially when working with expensive ingredients. 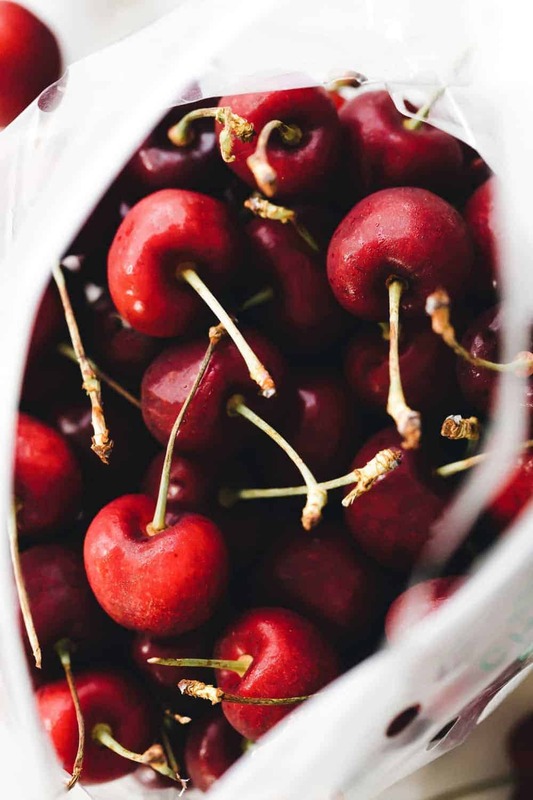 So when you say 5 or 6 cups of cherries….did 5 work better for you or did 6? I just don’t want to mess it up. I am using frozen cherries that have thawed. Can I use the juice from cherries in place of water, or just add the water to everything? 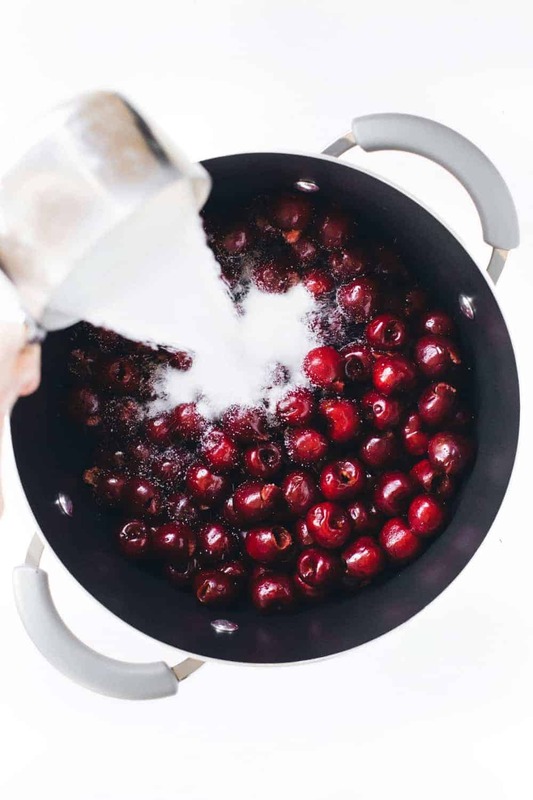 If you use the juice from the cherries, make sure to use the same measurement for the water and omit the water. Good luck! 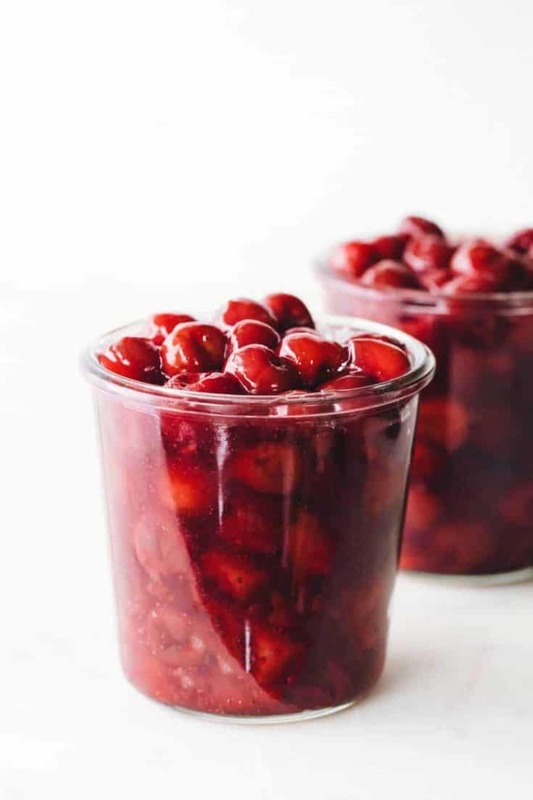 Do you think this could work as nicely as a blueberry filling, specifically for your cherry crisp recipe ( http://www.mykitchenaddiction.com/2011/06/cherry-crisp-in-a-jar-from-my-baking-addiction/comment-page-1/#comment-54441 )? I have a bunch of blueberries I’d like to use up, and this looks easy and tasty…but I wasn’t sure if it would work with another berry. I bet it would work with blueberries as well. Let me know if you try it! Is this recipe enough for just one pie? or does it do more than that? This should make one pie. Thanks for stopping by. 1/4 t vanilla and 1 1/2 T Anjous pear white balsamic vinegar. I add flavorings a little at a time until it tastes good. Thanks for stopping by to share. If you decide to freeze the cherry pie filling don’t use regular cornstarch. Use waxy maize cornstarch and your pie filling will be fine for use after thawing. I do this substitution when freezing pastry cream, pie fillings and stews. This was perfect! I made it into cherry pie, it was so good and I don’t even like cherry pie! Yum! Here’s the link to my crust and how I used it in the pie. Thanks! I’m glad you enjoyed the recipe. Thanks for visiting. 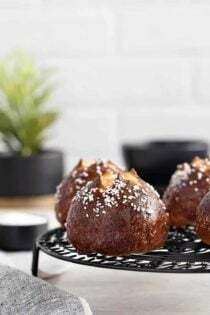 This receipe is wonderful. I made a couple of changes to match my personal taste. I’m not a huge fan of almond extract, so I halved the quantity. I substituted the water for the juice from a jar of morello cherries and instead of corn starch I used custard powder. Oh and just a hint of mixed spice. My tip for pitting cherries without a cherry pitter – I place the cherry on top of an empty wine bottle, then using the square (larger) end of a chopstick, push through. Your version sounds amazing! Thanks so much for stopping by! I was just going to make some personal sized cherry pies and freeze them. So if I use cornstarch they aren’t going to work out? 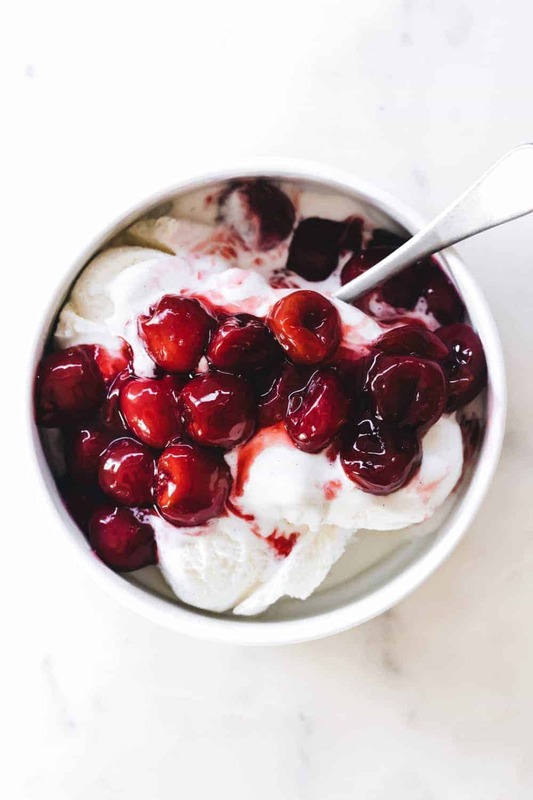 Yes, you can use frozen cherries. Thanks for stopping by! I just used your recipe to make my father a cherry pie as a father’s day tea treat, and it’s amazing!!! I doubled the almond extract, but otherwise copied exactly. It took a good 10-15 min to boil, then the liquid multiples a lot. The thickening starts at that point, and quickly heels into a delicious thick syrup any one would recognize as cherry pie goo! I used store bought refrigerated pie crust dough, and laid out out on a 9″ standard dish. We used about 3 pounds of cherries, and they cooked down perfectly. I put three stirring spoon fills in the pie dish, then used a slotted spoon to slightly drain the rest of the fruit, because i was worried it would be too soggy, and there was plenty still coming out of the cherries, which after 10 more minutes, has softened considerably into a lovely filling. I reserved the leftover cherry sauce to top yogurt and ice cream. I covered the pie with a second piece of dough, drew for slits through the center and baked in a table top toaster convection oven at 425, covered totally with foil, 20 minutes, then 10 with just foil over the edge of the crust, and 10 more uncovered. Beautiful, and delicious! THANK YOU for the prefect recipe! Thank you, Rebecca! 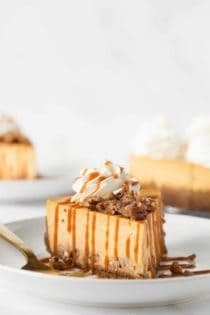 Your pie sounds absolutely heavenly! Please let me know, Perry! I hope you like it! I think the cornstarch will be just fine, Perry. Let me know how you like it! I was making this and cornstarch got all clumpy any suggestions. Hi, Patricia! 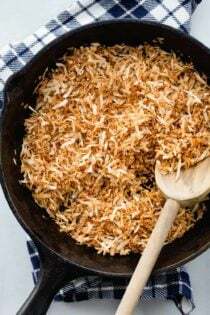 You could try substituting tapioca for the cornstarch. I hope this helps! thank you so much. we picked the cherries from our back yard. first time a cherry pie has ever been made from that tree. outstanding. we had cool whip topping on ours. Hi, Peggy Sue! What I wouldn’t give to have a cherry tree in my backyard! Your pie sounds fabulous! Brilliant – huge hit in Lisbon, Portugal. 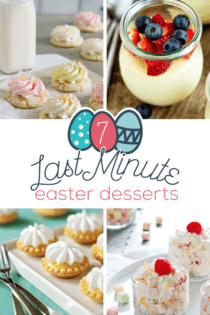 I used it to make a cake filling, twice now, and it’s delicious and easy! Wonderful, and so simple. We were gifted 2.5 lbs. of sweet, ripe cherries—far too many for our household of two to snack on. I used your recipe to make mini turnovers, and people loved them! 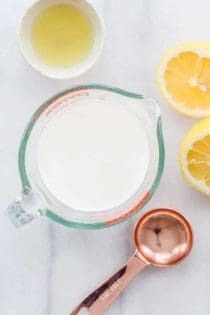 The only change I made was to use apple cider vinegar instead of lemon juice, simply because we didn’t have any fresh lemons in the house. I added a splash or so more to compensate for the sweetness of the cherries. Thanks so much for a stellar recipe. Yay! So happy to hear you enjoyed the recipe, M. Marie! I’m wanting to make a cherry cobbler using fresh cherries from the farmers market. Do you think this will work for that? Also, what size baking pan do you recommend? I’m needing to make enough for a crowd. Thanks! Hi, Charlotte! I think the pie filling would work for a cobbler. I would guess this recipe would be good for an 8×8 or 9×9 pan. 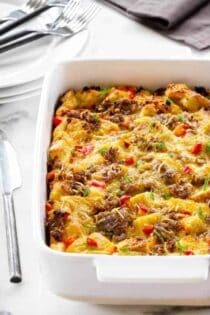 Feel free to double the recipe if you want to make it for a crowd. I hope everyone enjoys it! Let me know how it goes.